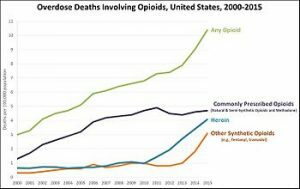 The opioid epidemic or crisis (use of strong painkillers, oxycodone, hydrocodone, and fentanyl) is rapidly increasing in the prescription and non-prescription use in the USA and Canada. Opioids do provide answers to a couple of medical issues. Patients can have many complex pain problems, with no quick and easy solution to the problem. Many times this will simply require too much time and resources to identify the problem area, so a quick response is to dispense some pills and the problem is solved. America is about 5% of the world population, yet we consume an estimated 80% of pharmaceutical drugs in the world. Could medical marijuana help put an end to the opioid epidemic? Instead of putting man-made chemicals into your body, how about using a plant that comes straight out of Mother Earth. Pharmaceutical opioids do have many side effects excluding all the overdosing and deaths. Cannabis has the power to help people reduce their opioid use and in the process save lives. Cannabis, on the other hand, is nontoxic and has been proven to be safer than most of the pharmaceutical pills that are out there. Most people should be able to replace some of their health professional prescribed drug, with medical cannabis and potentially save a life. Get Rid of high priced drug(fentanyl) that is Doctor prescribed. It is no secret that prescription medicine in the USA is getting more expensive every year. Medications for pain, anxiety, migraines and sleep disorders are especially pricey. There are generic drugs available for some of these pharmaceutical drugs, however, there just doesn’t seem to be enough to help out. The issue here is that the pharmaceutical companies are not allowing the generic companies access to their products, so they can produce the cheaper generic ones. Congress is supposedly working on this issue. Medications are not cheap in America and they are always going up in price. Until some relief can come from the generic pills we just have to pay more and more. The medical cannabis prices are getting more consistent, with the opening up of more shops and the competition is growing more and more every day.